In the third century before the Common Era, Emperor Shih Hwang-ti joined together a series of defensive walls to create the Great Wall of China. The wall curbed raids from the nomadic Mongols, fierce warriors who lived northwest of the kingdom on the cold, dry land called steppe. For centuries, Mongol tribes eked out brutal lives raising horses and sheep while living in movable tents called yurts. In the 13th century, a charismatic leader united the Mongol tribes into an in a disciplined military state that grew into one of the largest empires in history. Genghis Khan was one of history’s greatest conquerors. The son of a minor chief, he was born in 1167CE and was originally named Temujin. When Temujin was nine years old, his father was poisoned and the other Mongol chiefs abandoned his family to starve. Temujin sought revenge for his father’s death as a young man by leading a small group of warriors. Temujin was substantially outnumbered in his early battles, but his well-trained horsemen and brilliant tactical strategy overwhelmed his enemies with brute force. 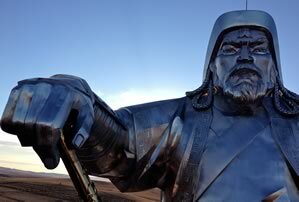 His army grew so large that in 1206, the Mongols proclaimed Temujin as Genghis Khan, or “Universal Ruler” of the Mongols. The following year, Genghis Khan led the Mongols on the first of many destructive, bloody invasions of foreign lands. As his horsemen approached a village, they offered rulers the option of surrendering peacefully or being destroyed in a brutal attack. Genghis Khan never learned how to read, but his success as a ruler resulted from his superior military organization, strategy, and mobility. Nobody knows exactly how many people were slaughtered by the Mongol’s destructive raids, but even the most conservative estimates suggest that Genghis Khan’s army killed several million people. At its height, the Mongol Empire stretched from Korea to Hungary and as far south as Vietnam. It was the largest land empire the world has ever known. As the Mongols added new territory, they developed trade routes that connected the eastern and the western worlds for the first time in a millennium. The Mongols provided safe travel to merchants while collecting taxes on the goods that passed through their realm. The Mongols developed a system of communication that linked all parts of their empire. Emissaries carrying official badges were provided with fresh, rested horses at stations which allowed them to quickly carry messages over long distances. Genghis Kahn’s grandson, Kublai Khan, conquered China and moved his capital to the city now known as Beijing in 1271. Kublai Khan probably did not know how to speak Chinese, but he took the Chinese name Yuan for his dynasty. The Yuan was the only foreign dynasty ever to rule all of China. Because the Mongol emperor did not trust local officials, he hired foreigners to help govern his empire. A merchant from Venice named Marco Polo wrote in his famous book that he worked for Kublai Khan as a governor for seventeen years. The Mongols became less warlike after Kublai Khan’s death in 1294. The Chinese people came to resent the Mongols as an elite, privileged class exempt from taxation. By 1368, several natural disasters and a peasant rebellion caused the Mandate of Heaven to shift to a Buddhist peasant named Hung-wu. Hung-wu expelled over 60,000 Mongols, ending almost a century of Mongol rule in China and the beginning of the Ming Dynasty. After Kublai Khan died in 1294, the Mongols became less warlike. They were resented as an elite, privileged class exempt from taxation. Several natural disasters and a peasant rebellion caused the Mandate of Heaven to shift to a Buddhist peasant, Hung-wu. Hung-wu expelled over 60,000 Mongols, ending almost a century of Mongol rule and beginning of the Ming Dynasty. The Genghis Khan Equestrian Statue is a 130-foot tall statue near Ulan Bator, Mongolia that was erected in 2008. 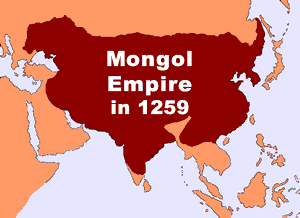 In 1259, the Mongol Empire was the largest contiguous land empire in history. It stretched from Central Europe east to the Sea of Japan; from Siberia in modern Russia to as far south as the Indian subcontinent. 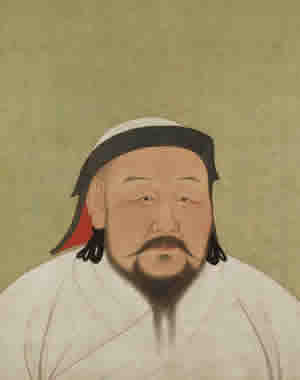 Kublai Khan (1215 – 1294), was the grandson of Genghis Khan and the founder of the Chinese Yuan Dynasty.